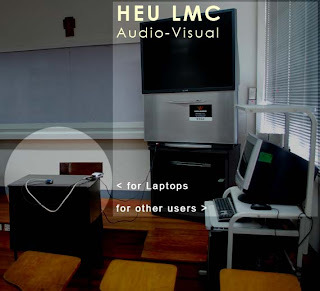 The Higher Education Unit Library Media Center AV installed new classroom equipment with separate connections for the portable computers of users. The following example is the setup we have at the Foreign Language Room (CAR-308). All loose cables are ready to be plugged in to your laptops (some, through a PC to TV Converter). · USB (white or gray) plugs in to your USB port to power the converter. Note: This is not for video or data connection. Cables that are permanently fixed with wire or tape should not be removed. Please ask for assistance at the AV Satellite (PA-200) if you need help in connecting your equipment. An Audio Cable (black miniplug) is also available for your laptop. In CAR-308, the cable connects to the Projection TV. The PC Speakers set is for the desktop computer. As courtesy to the next user, please return all the cables and equipment back to their initial positions and settings. Please inform us if you suspect that there are missing cables or equipment in the room. We can be reached at Tel. No. 580-5400 Loc. 2083.